I have been seeing a lot of good Synology DS418J reviews online, and I thought that it is a file storage solution that we will be able to use at home. My wife, kids and I have a lot of data – some of which are for work and others for enjoyment. 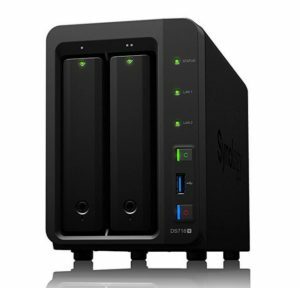 Synology DiskStation DS418J 4-Bay NAS Server is a file storage and backup system with RAID functionality that has been specially designed for home computer systems with multiple users. 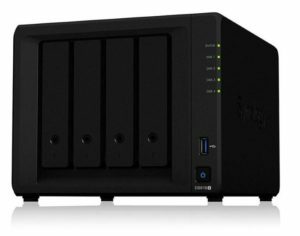 If you are looking for cheap 4 bay NAS system for small office, you should check out Synology DS418 model. DS418J runs on Synology DiskStation Manager (DSM) software which is rich in multimedia features and provides all users with seamless backup, internet access sharing, and energy conservation options. It is incredibly cost effective as well making it even more suited for use at home. With the DiskStation DS 418J, you will be able to make use of all 4 hard drives that are installed in this device. What this means is that should one hard drive fail, the data stored on this drive can be retrieved thanks to Synology’s well build backup solution. The discs are in hybrid RAID format which allows them to be of different models and sizes. If you are not sure how to go about building the RAID system, a built-in wizard will guide you thru the setup process. Synology DS 418J also has a feature where the device will back up your data to the external hard drive on a preset schedule. Should your disk system fail, all your data will be stored safely in the backup drive. You can find more information about the unit’s features if you will check out Synology DS418j user manual below and you can also check out the comparison tables in 4 disk model overview. Because you will be using it in a multi-user home, it makes sense to have multiple shared folders. You can create a multi-user system with individual shared folders, but this can be complex and time-consuming. However, you can simply make a few folders in which only one or two users have full access to it, and everyone else has read-only access. The streaming capabilities of the Synology DS418J are impressive. Users will be able to simultaneously stream 1080p Blu-ray movies as well as audio tracks smoothly. This makes it ideal for people who will be using the unit to watch or stream movies or listen to music. Synology DiskStation DS 418J works very quietly. This is one of the number of features that sets it apart from other similar data storage systems. We have read about consumers who are complaining about the noise their storage systems are making, but it is not an issue with this model. DeskStation DS418J has been built to operate quietly even at full power making it an excellent choice for using it at home. This NAS device features 1GB RAM, and people are often asking if it is possible to add more memory. Unfortunately, the answer is NO. Memory is soldered to the motherboard and there are no additional RAM slots, so upgrading RAM is not possible. Most consumers have given high ratings in their Synology DS 418J reviews. It has received impressive ratings when it comes to its appearance, ease of installation and setup and ease of use. Many consumers are impressed with the fact that the system runs on very little power – 45 watts – which means that it is energy efficient. There have been a few complaints though when it comes to its photo album sharing. The quality of the images is not that good, and this can be a bit of a problem if you will be working on photos often. However, it won’t have too much of an effect when you use your Synology NAS system. Its other features and applications will definitely make up for this slight problem. Click here now to see Synology DS 418J DiskStation 4-Bay (Diskless) Network Attached Storage deals and discounts!